Not much taste in this one, very light, with soft watery mouthfeel, some chemicals usage detected, but not unpleasnatly so. No stand out character, to light for that. Theres not much more i can say about it other than i t was the first beer i ever had from Austria. Definitely not the best, but not totally unpleasant. Pours an intense golden tone which is not quite fully transparent, with a large and thick foam head that fades but still leaves a dense layer, as well as lacing. There is also some carbonation there. The smell is not very nice but rather penetrating with acidity and some alcohol presence, rather low on hops or malt. This defines the taste itself, highly carbonated and very soury and bitter without an actually commendable presence of ingredients as malt (which is perceived but in a bad way). Mediocre, at US$1.45 a can I won't be buying it again. Pretty standard bland eurolager. Comes in a 33cl brown curvey bottle with a foil label around the neck. The German label says 5.4% ABV, but the Russian translation pegs it at 4.9%. Hmm... loses half a percent on the trip east??? Purity law applies. Best before 7/2004, I opened it on 12/16/03. Pours a deep clear gold under a thin 1/2 finger off white head that fizzled pretty quickly. The nose is too mild, with only a hint of German hops. The mouth is prickly, but has a pleasingly substantial body to it. The opening is standard malt, followed by a standard hoppy bite. The aftertaste is decently bitter, but ultimately unremarkable. If I had to choose between this, Heineken, Stella and others of its ilk, I'd pick this. But I'd be disappointed in my selection. just a smidgeon better than the standard euro lager, i found zipfer to have more character than i was anticipating. notthing to go gaga over, but was still ok in my book. the thing i liked most about this beer was that is was a little more fruity and floral than the usual lagers. quite zesty, some summer fruits there and a decent but not huge floral hop presence both in taste and smell. had a pretty fair malt aspect also. didnt look like anything out of the ordinary, but i was happy with what i was drinking. i finished my six pack and was happy to go back for more at a later stage. the ABV isnt noticed in the drinking, and has a good crisp, slightly hoppy finish that goes along nicely with fizzy carbonation. like the bottle too. ive noticed kronenbourg 1644 have copied this since. i enjoyed zipfer, it had something different to others of the variety that impressed me on a certain level. sure you can get a better beer, but this is one to give a good going over when you dont want to get too serious. The first thing that hit me when I took a whiff of Zipfer was a sharp lemony tang emanating from the curvaceous brown bottle. The zestiness wasn't as evident once the beer was poured; what became slightly more noticeable, surprisingly, was a pleasant hint of earthiness. I thought this smell was interesting but strange. Was that yeast I was picking up on? Clear-bodied with a lot of bubble action (although, on tasting the beer, it isn't overly carbonated). Average head and lacing. Despite having an ABV of 5.4%, alcohol flavours are not pushed to the foreground. The initial flavour is gentle and sweet followed by an equally gentle dryness. Some minor fruit aspects (courtesy of the yeast I mentioned earlier?). Lightly hopped. Zipfer is soft on the palate, and, with a nice level of carbonation, it went down very easily; not watery by any means, but rather light, at least in terms of flavour. It isn't the most aggressive of pilseners in terms of aroma and taste but it is a relatively inexpensive alternative to macrobrewed offerings. It's kind of like what Bud should be. I understand that Zipher is also known as Zipfer Urtyp and according to the Brauerei Zipf's webpage, "Zipfer is only available on international markets as "Zipfer Original." The first time I tried this I was a bit drunk, the second it was 8 months out of date, but this review is based on several bottles after that. The beer pours with a light amber colour, smelling of hops and malt. The taste is of a more complex lager, with more taste than that of becks or heiniken. On draft at Delaney's, the distributor pushed it. Like a macro beer really. Cheesy aromas. Ginger ale coloured body, with carbonation bubbles, and no head. Little taste,mouthfeel, or ability to drink it.I think there was some beer ingrediants in there. Tasted on 18th July 2005, bottle best by 10.2005 (L141FD.4) 0.66L labelled Zipfer Urtyp Vollbier ABV 5.4%. Appearence: Nice white head atop a straw coloured body. A little "dilute" looking. Smell: nothing much to write home about, some hops with a freshness. Taste: Fairly bland and not troubled by complexity. Average mouthfeel. Drinkability: might have another one, if there was nothing else around. I won't purchase again however; life is too short! Pricey, at 3.70. Pours pretty good for the style, though not great. Head's a little dead but it's pretty color of gold. Smells of solid Euro hops and pils malts. Nothing bad going on here. Tastes... off. Too sour, kinda. Starts like a normal european/czech pils but then it falls into this messy soapy background that kinda hurts my stomach and really tastes crappy. B-but it's not really the taste, man, it's more like it just hurts the back of my tongue and then it makes my stomach feel icky. I haven't eaten or drank anything before this that should mess me up. It just hits me funny and that's bad. I cracked this one open, stinging for a nice cold beer after an exam, and I was surprised at how crap it was. Bottle is a little unusual, but beer's appearance was average, lots of bubbles on sides of glass at first. Head retention not so good. Yellow, flat-looking lager. Hmm. The smell - and bear in mind I had earned this beer, so I wasn't expecting much - was quite distressing, I pinpointed it precisely to that leftover slightly infected malty goo smell you get after home brewing - you know that brownish malty dead yeasty sludge? It smells like that. And you can detect that smell in the taste as well, though it's not as strong, on the palate - particularly the aftertaste. Taste is not great. Tastes like it could have been brewed here in Australia, though it's better than a crownie. Acrid, eurolager flavour but absolutely nothing remotely special or even nice. I should have had a lemonade. Skunky hop flavour on the palate indicates this beer is not am frischsten: although it's best before 09.2005, it's probably been in that bottlo a while. Mouthfeel is tumescent but banal. Chemical aftertaste. Drinkability... let's just say I would drink Toohey's Red before buying another Zipfer - if Foster's is Australian for Beer, then Zipfer must be German for "Austrian Swill". A synonym, then, for "österreichisches Gesöff". Not my favourite. This was the second beer I had when I was in austria. I had just finished a glass of Edelweiss and thought I'd try something new. The bartender reccommended this. Poured amber from tap. There was a great big white head that dissapated quickly. The taste was rather dissapointing. Slight malt flavour followed by a hop bitterness. Not the best beer I have ever had but not the worst. This is a fairly anoynmous European lager, decent but nothing to write home about. With the Germans and Czechs right next door you'd think Austria would be producing beers with more character and maybe they are, but I haven't yet stumbled across them. Even the label and bottlecap of this beer is kind of boring. Zipfer features a nice gold color but utterly lacks head. The smell is crisp, featuring a pleasantly light citrus/wheat combo with no backround cereals to distort the flavor. The taste is basic but solid with a nice bitterness present in the aftertaste. Unfortunately this is somewhat diluted by an abundance of carbonation. This is drinkable and nice but didn't fire my imagination or my taste buds. Pours a golden colour, light carbonation. NO head. Terrible. Strong beer-y nose. Mostly bitter, some richness but mostly just simple. Low-tasting rich characteristics: there is a boldness in the palatte that demands attention. Lagery front palatte, then descends into a very curious richness. This certainly isn't a standard beer, even though it seemed like it at first. There is something else to it. It's a man's lager, very continental and quite bold but meant for drinking, not tasting. Certainly worth a try. Overall average, but it was easy to drink and would make a good session beer. We had a few whilst in Vienna. Served on tap at some little bar near the main cathedral. The color was a deep gold. They served it pretty cold which was nice for that hot day, but it may have dulled the flavor because I didnt taste much. It had sparkly mouthfeel. That was probably the nicest thing about it. Golden yellow color with a frothy, white head. The head is mostly diminishing, but with a good lacing. Clear sparkling body with an average density. Doesn't have a very strong aroma, but a weak smell of citrus and straw. Initial flavor is a bit sweet, the finish is rather bitter. Medium body with an oily texture and lively carbonation. An average pale lager, not very good, not very bad. Appearance: Poured from the 500mL can. 2.5 fingers of pure white head on top, and plenty of carbonation visible. Taste: Sweet with bready malt, finishing with a tinge of lemony/fruity hops. Very smooth with little or no bitterness in there. Awesomely drinkable, but nothing special tastewise, and somewhat expensive. A: Pours a rather pale yellow, with a light white head, good retention, above average lace fo the style. S: Noble style hopping, some bready malt, pils-esque but mild. T: Grassy hop flavour is the main taste. Malt is very light bordering on macro lager. Tastes fine, I just wish there was more to it. M: Frothy soft carbonation, light-bodied, smooth. D: An interesting Euro lager, right in the middle of the style for me. M&gt; The flavour is gentle, sweet an dryness in aftertaste. The yeast is present and is a little hopped. .5L, best before January 2012. Lager from Austria, brewed with rice in addition to malted barley. This is a good-looking beer. Clear, effervescent yellow-gold and a nice two-finger head with some staying power. The aroma is faint, with some vaguely grassy and lemony hops. There's still something a tad artificial about it though. The flavor is surprisingly bitter-- this stuff's got some balls! Then again, the artificiality of the beer comes through again, with notes reminiscent of kitchen cleaner or something, but nothing too offensive. Traces of grain on the aftertaste. The mouthfeel is drying and a bit over-carbonated. This stuff isn't too bad. It's pretty refreshing and bitter, though I'd take a well-made Pils or Helles any day over it. 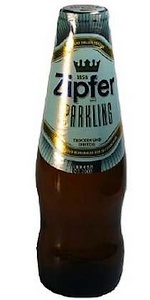 To its credit, I'd take a Zipfer over any of our rice-brewed, watery macro-lagers in the US. A: The beer pours a clear golden straw color with a short lived white head. S: I can smell the skunk before I even pour the beer. Lots of sulfur on the nose, and some definite grassiness. Some decent sweetness underneath with some mild bread and some corn. T: A lot of grassy hops with a fair amount of bitterness. The skunkiness is still there and certainly off-putting. However, the beer is sweet overall and has a nice bit of malt in addition to the adjunct sort of flavors. M: Fairly light in body with a medium to high level of carbonation. O: Could have been pretty good, but the skunkiness just really ruined it. Pours golden with large and foamy head that remains in very thin, but dense layer, very limited lacing. Aroma is straw malty with limited grassy hops. Taste is rather watery malty with light lemony hops and almost no aftertaste. Overall, expensive and quite bad beer. I was attracted by label mostly and would not drink this one again.